I tore my right ACL playing in a men's league baseball game. I am 34 years old and a former college and pro ball player. I was playing first base and jumped to try and catch a high throw from 3rd and when I landed, my right leg was planted and at full extension. At the same moment the runner collided with me and I felt a strong pull and my knee hyper-extended. I ended up tearing the ACL and LCL. I knew immediately as my knee gave way entering the dugout. I also have a torn ACL in my left knee from playing basketball and skiing that I have been dealing with for a year. I was putting it off to get fixed until the fall. I wore a brace and had few issues. 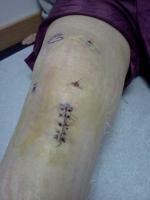 I had my surgery on my right knee October 21st and am a week post-op. I am off crutches and am at 95 flexion. The surgery went smoothly but after day 6 post-op the pain has increased. I am working hard at the therapy exercises and am feeling stronger but sleeping is when the pain is the worst. I also get a rush of pain when I get up on my feet. My doctor said I could get my other surgery 3 months post-op for my other knee. My ultimate goal is to be back on the diamond in July. I would like to hear similar stories so I can be more optimistic about being recovered from 2 ACL surgeries by July 1.